You know me, I love all dogs. Big ones, little ones, furry ones, and ones with no fur at all. But there is one type, one breed, that leaves me so gobsmacked, that I find myself stopping and staring upon every confrontation. I can’t think, I can’t move, I can do anything but admire this dog’s majesty. Is there a breed that does this to you? For me, it is the Irish Setter. There is something so magical, so captivating about this dog that I am dumbstruck as I watch him or her pass. I haven’t been fortunate enough to meet many, yet the ones I have caused a visceral reaction. I can’t explain it. They are dogs out of the fantasy realm, like unicorns or dragons. I’ll never forget a certain encounter that occurred in the off-leash woods outside our home in Bedford, Nova Scotia over a year ago. Shiva and I were wandering along the narrow path in the early morning. It was a misty day, with the fog teasing along the roots of the trees. All of a sudden, there was a rimple in the leaves to the side. Within seconds, a tall, beautiful dog entered the small clearing, the airborne dew floating about his tall frame. He paused there, his head held high, his hind legs splayed back. His copper fur glowed in the dim light, complimented by the greenery behind him. Even Shiva stopped to stare, too struck by his fantastical display to make a move. As quickly as he had arrived, he vanished, leaping off into the trees after an unknown scent, leaving a trail of wonder behind him. Shiva and I looked at each other, wondering if we had just imagined the experience. This is how I will always view the Irish Setter. A regal, magnific breed, far out of my league. They are the dogs of fairy tales and legend, to be viewed upon with admiration but never owned. Am I crazy? Is there a particular breed of dog that causes this feeling of awe in you? Love your description if the setter you saw. I experience this every weekend when we walk with Clover. She is goofy and fun and quirky and so majestic. She is as you described here. Amazing breed. Oh my, your experience of meeting the Irish Setter in the woods that day was captivating! The way you described the encounter was so vivid, I felt I was right there with you and Shiva watching this magical moment that you will be imprinted in your mind forever. Irish Setters have that effect on me too, they are so majestic and proud, and who can resist those beautiful, expressive eyes. Sounds like a magical encounter! I don’t think there is any breed that I particularly love, although I would love to own a boxer, although (and this sounds bad) a pretty one. You get some that are stunning, and others that aren’t as lovely. Irish Setters are definitely beautiful, but the ones I’ve met haven’t exactly been A students. A sharp brain is the most important trait I look for, so I am most attracted to the herders. A big beautiful solid black German Shepherd (of the old style without that stupid sloping rear end) is my idea of canine beauty. I’m with Taryn, they are stunning dogs, but not necessarily sharpest tack in the box 🙂 But watching them do agility is really something else, they are so graceful and elegant as they jump and weave! I personally love flat coated Retrievers – personality and looks! And actually pretty close to the image you posted! 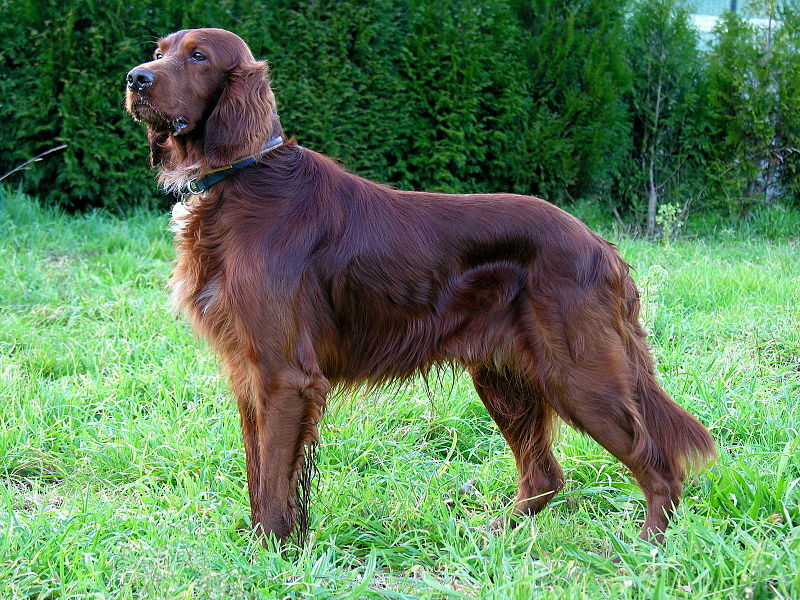 Growing up – my aunt and uncle had an Irish Setter. He was magnificent. I remember I was petting him and I stopped and he howled at me until I started back up again. I think his name was Ivan, but I really don’t remember that part. I just remember how silky and red his fur was, and the howl of disapproval when I stopped giving him the love.